From California's redwoods to New York's apple orchards, celebrate the place that has your heart. Bring your home state's natural beauty into your own home with this charming pillow. Whimsical illustrations and playful poems using the state nickname are an ode to the landscapes, plants, animals, and special details that make it unique. From California's majestic redwoods and dramatic Joshua trees, to New York's apple orchards and forest glades, celebrate the place that has your heart with sentimental style. Each pillowcase is made of durable cotton, and the zippered closure makes it easy to remove and wash in your machine. Illustrations by Sandra Dumais. Poems by Martin Geller. Click here to see our Ode to Home State Tote Bag. 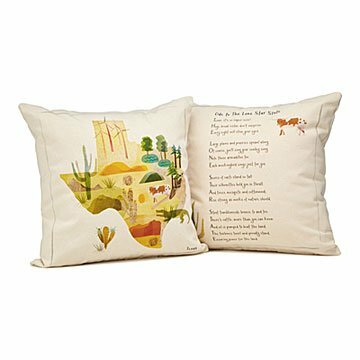 Cute pillow showcasing some fun facts about a great state! Looks great on his couch and is a great reminder of New Mexico! Serves the purpose. Only negative thing: Like I said before, I wish the material was softer. My brother is the most difficult person to shop for! As he is a bachelor he can always use a decorative touch! This is cute, such a conversation piece, and looks good on any sofa, couch, bed, etc. The state design is great and offers such a wonderful gift!